Suitable for cutting ceramic, terracotta and quarry tiles up to 330mm square and 10mm thick. Dual chrome-plated heavy duty steel rails ensure smooth scoring. 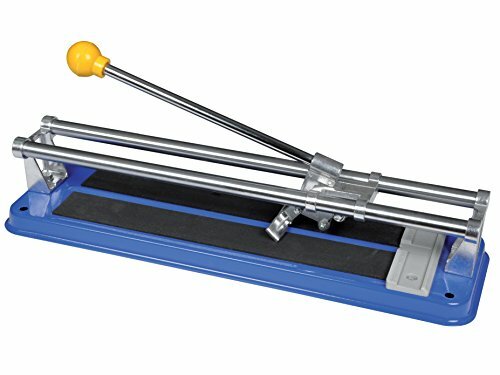 The Vitrex 102340 Manual Tile Cutter has a steel flat bed and a simple score and snap cutting action, ensuring ease of use. It is suitable for cutting ceramic, terracotta and quarry tiles up to 330mm square and 10mm thick and ensures a neat, straight edge. It is also able to make diagonal cuts on tiles up to 254mm square. The 13mm cutting wheel is made from tough tungsten carbide, which offers both strength and durability. In addition, the dual chrome-plated heavy duty steel rails ensure smooth scoring. Maximum Straight Cut: 330mm. Maximum Diagonal Cut: 254mm.Maximum Thickness: 13mm.